Want your voice heard this election? Oh, and want free pizza, too? Then join us for a fun, interactive event this Friday, Oct. 21 at noon at Northern Kentucky University. The event will be filmed at NKU's MAC Court in the Campus Recreation Center. Participants will be asked to answer a series of "yes" or "no" questions in a creative way that will explore how divided or united our community is on key issues in the election. Participants will also get FREE pizza and WCPO Insider swag. FILL OUT this short survey if you are interested in attending. 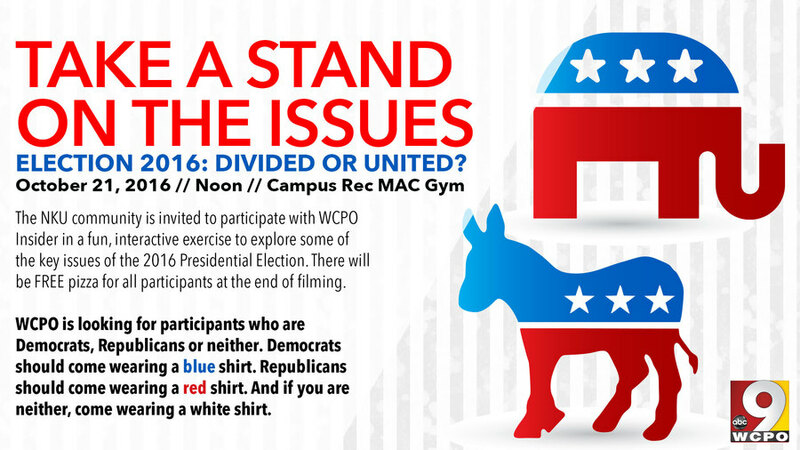 WCPO, in partnership with NKU, is looking for Democrats, Republicans, and those that associate with neither group. Democrats should come wearing a blue shirt. Republicans should come wearing a red shirt. If you are neither, wear a white shirt. To RSVP, go to our survey and answer a few short questions. This is open to everyone. WCPO will require an even split of Republicans, Democrats and Neither, so WCPO reserves the right to manage the participation with that balance in mind.